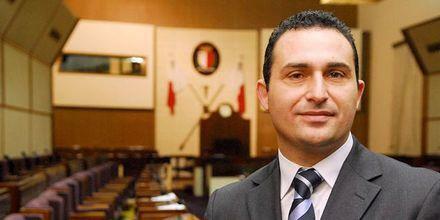 Franco Debono abstained in the confidence vote in the government today, but the Opposition's no confidence motion was defeated with the Speaker's Casting vote after a tie of 34 votes in favour and 34 votes against. Debono took a step back from his previous declarations, opting to abstain rather than vote against the four-year-old Gonzi administration, thus ensuring its survival. The result means that, legally, the government can carry on, although questions will be raised about its stability and ability to govern, particularly since Dr Debono has declared that he will not support the government. It still has to be seen whether he will back the government on important legislation, including two money bills which are already before the House - or whether the government will depend on the Speaker's casting vote. The Prime Minister has already hinted that a tie would be an unsatisfactory solution to the current crisis. Dr Debono spoke yesterday and lashed out at the government for failing to push forward what he said were much-needed reforms of the Constitution and the institutions which provide for effective democracy. He also insisted that ministers should account for their actions, and resign when they failed, rather than act like they lived on a different planet than the rest of the people. He also complained that his protests to date within the organs of the Nationalist Party and the government, had not been heeded, leading to him to his current actions. Earlier this week he had indicated that he might abstain rather than vote against the government, saying that this would throw the ball into the government's court and leave it up to the prime minister to take the decisions that were needed.